Dokter Gigi (as funny as it sounds) simply means dentist. 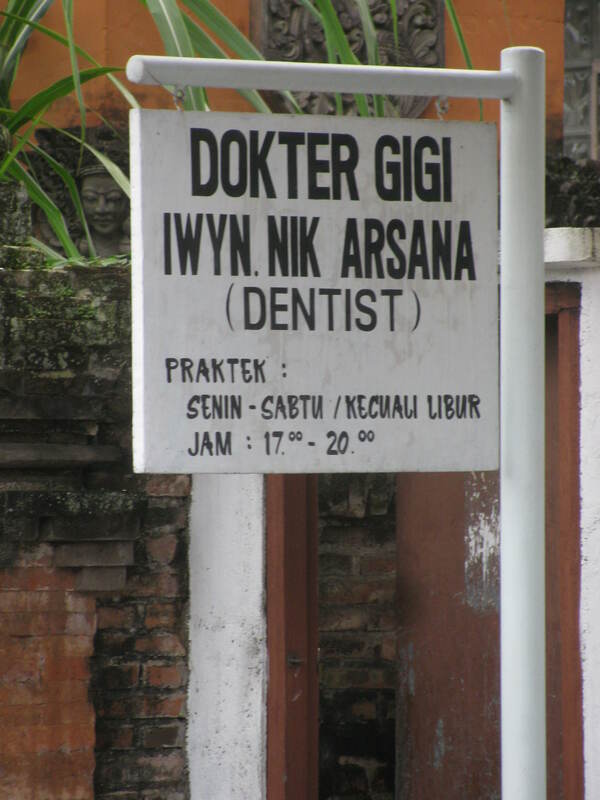 There are many dokter gigis around, but I’ve never had the courage to walk into one of these offices; not because I’m opposed to going where the locals go, but when it comes to dentists, I am slightly obsessed about hygiene, sterilization, that sort of thing. And from what I heard (from long-term expats, more in the know than I), it made sense to seek out a dentist that services foreigners. Which is how I ended up at an uber-deluxe, majestic-looking hotel resort complex called, appropriately enough, The Mansion. The Sayan Aesthetic Institute offers treatments such as Botox, Radiofrequency Rejuvenation, Dermal Filler, Lipotomy 2.0… and dental work. I opted solely for the latter – but you get an good idea of the clientele that frequents this joint; medical tourism at its best. All in all, it was a pleasant and pain-free process: The cleaning, scaling, de-plaquing, checking for cavities, gum recession and leakages took about 45 minutes; the English-speaking, Java-born dentist worked cautiously and gently in light of my sensitivities. When she said ‘all done’ I asked about taking xrays. Yes, she said, in the room next door. The dental assistant showed me the way, opened the door to a small all-white room with a built in cupboard, a swivel chair nearby and a large machine in the corner. No dental chair anywhere. Where do I go, I asked. Here, she pointed to the machine and led me over. I felt like an alien. Before I knew it, anoth er assistant draped over me a full-length radiation guard pad, which covered my whole back, slung over my shoulders, with two loop-holes that I was told to put my thumbs into. Then I was asked to step into/under the machine, and bite down on a little yellow plastic piece mounted on an arm extending out of the machine. It was all so utterly hi-tech I was speechless. The two assistants closed the door behind them, leaving me alone in the room with one of this century’s futuristic inventions, called, appropriately enough I think: Orthophos. It circled my body, emitting only the slightest whirring sounds, quiet enough that I could still hear dogs barking outside, motorbikes scooting by. It was over in seconds, and when I was led back to the other office, the dentist was already (!!) looking over the panoramic images of my teeth. Hooray for immediate results of Hi-tech Gadgetry! Here’s the thing, the highlight, the reason for my over-the-top gratitude to this clinic: I Did Not Have To Sit Down. Unbelievable, but true. Yes, Virginia, there is at least one dentist’s office in the world where you do not have to SIT to get xrays taken. And I, surprisingly enough, blissfully, blessedly, was guided to that very clinic. I felt like a million bucks when I left the clinic (though I paid significantly less for the treatments), relieved to learn that nothing too serious was lurking beneath fillings and gums. 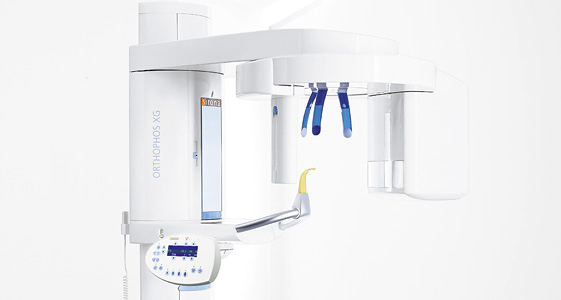 When I returned home, booted up my laptop and went online to learn more about this near-silent and astoundingly efficient creature, I discovered that the name of the (German) manufacturing company that deserves the credit is… Sirona. Thank you my angels of yesterday; Sirona, healing goddess, German company, Indonesian importer, Balinese luxury resort, Dr H and staff… thank you all for unwittingly guiding me to a place where I was asked, for once, to STAND. Amen. Patient anxiety sometimes built ‘untrust’, so it dependt how the dentist mantain that situation……. Thanks for dropping by Dedy. I think I agree with your equation 🙂 at least most of the time!